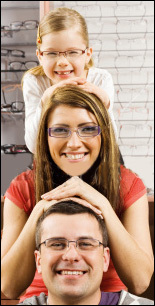 Gopen Optical has over 100 years of experience. Our commitment to you goes beyond just glasses. We ensure that the frame and the lenses are done properly and promptly; guaranteeing you a perfect fit every time. We also provide adjustments even after you've had your glasses for a while. We offer frames and sizes for everyone in your family. Okay, maybe not everyone in your famliy but we are pet friendly. 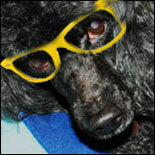 (Shelby is sporting the new Ray Ban Wayfarer frames, available in great new colors. He refused the cat eye frames we suggested.) Has anyone even seen the cat?